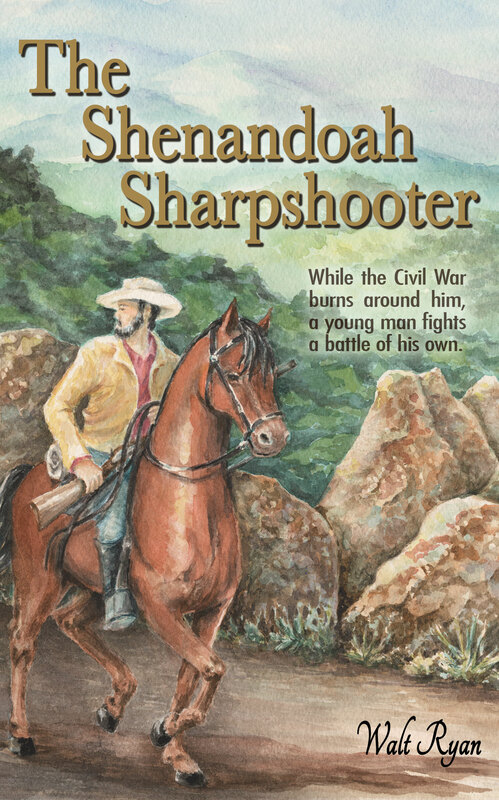 I am pleased to announce the release of my second book, The Shenandoah Sharpshooter. This adventure novel takes place during the last year of America’s Civil War. It begins in the beautiful Shenandoah Valley and the Blue Ridge Mountains of Virginia. The fictitious characters are set against a backdrop of real places and real events. For the most part, the characters are portrayed with the fears, anger, concerns, and emotions of people living the experience of war. On both Union and Confederate sides there are the good, the bad, those that love, and those that hate. Although the book is fiction, it is my intent to frame real life as it was. This is the first book of an intended trilogy called The Coldiron Series. The other two books are still in the works. I have released The Shenandoah Sharpshooter to commemorate the 150th anniversary of the ending of the War of the Rebellion. Here is the first Chapter of the book. I hope you enjoy it. The Shenandoah Sharpshooter is available at Amazon in both print and Kindle form. Ignoring the question, the old man gazed intently down the valley road. He was uneasy. The younger man could tell. “Stay there. Take the harness off Ben, and get ready to run. If they get too close, ride out. Go up into the mountains, you can lose them there. You can circle around, and come back in after a day or two. “Now Stephen, they may go on without any problem, but if something happens to Eppie and me, you light out. You go west to get away from them. Don’t come back until this damn war is over. Go on across the Alleghenies. Go into West Virginia, or better yet to Pennsylvania. Follow the same route we used to take the mules to Ohio. As long as you’re on that horse you’re safe. He’ll outrun anything they got. Take care of him, and he’ll take care of you. The old man turned and looked at the youngster. “Remember what I’ve told you, boy. All right they’re out of sight, get going.” As an afterthought the old man said, “Don’t go onto Massanutten Mountain unless you must. They could trap you against the river or the pike if they was a mind to.” Then he turned and started down towards the house. Stephen Purcell ran to the sack, snatching it and his buckskin jacket as he went by. Reaching Colonel Ben, he threw the potato sack and jacket across the big chestnut horse’s withers. Jerking the picket rope loose, he grasped a harness hame and threw himself up behind the potatoes. Picking a path over hard ground, he traveled up the draw just below the crown of the hill and out of sight of the road. The stock pen was under a large rock overhang. It was well-hidden and almost out of sight. The horse, a cow, and two sows had been kept there since the last raid on the farmstead the previous fall. Water trickled through the pens from a spring. Grain for the hogs was carried to the cave in sacks on Colonel Ben’s back. The cow and Ben had been grazed in secluded fields, well away from the farmstead. Purcell circled around hurriedly and came in from the far side, still trying to hide his tracks. He jumped down and pulled the harness and collar off the horse. He tied the rope to an oak sapling and raced back down the draw. He feared for the old man. Uncle Granville had said, “If something happens to Eppie and me…” Purcell figured Granville was expecting trouble. He disobeyed the order to stay put, without a second thought. His mouth was dry, his chest tight. He wasn’t even conscious of his feet hitting the ground. Purcell reached the lower stone fence and hurled himself over it. He paused to catch his breath. He heard shouting, followed by the crack of the squirrel rifle, and the thundering boom of a heavy caliber gun. There was more shouting accompanied by three pistol shots. Someone swore loudly. Then silence. Purcell crept along the fence on his knees. As he reached a vantage point over the yard below, he cautiously peered over. The scene below made him sick. Eppie lay face down in front of the doorstep, the squirrel rifle still clutched in her hands. Granville lay motionless on the ground. A dead man in a Confederate uniform was sprawled a few feet behind his uncle, back against the wood pile, with his unsheathed saber lying across his legs. Several feet away some of the raiders were standing over the body of another Confederate cavalryman. The woodpile axe lay nearby. Purcell knew what had happened. The man with the saber had threatened or stabbed Granville. Eppie had grabbed the squirrel rifle and killed him. The other one had shot Eppie. Granville, in a fit of rage, killed Eppie’s shooter with the axe. The raider mounted on the gray horse had shot Granville. The pistol was still in the raider’s hand. He had deliberately put three balls into the old man. Purcell knew what he would do. He would wait. Wait for his chance. After the first raid, Granville had hidden his heavy old Hawken plains rifle and Ben’s good plantation saddle with some other things under the floor of the house. Purcell planned to retrieve the rifle and saddle after the Rebs left. He vowed that he would hunt down the man with the pistol. He looked again. Some of the raiders were looting the house. Others were digging graves in the corner of the yard. He slumped down again, unable to watch them bury Eppie and Granville. He fought back tears of grief, and finally the tears came. He sat there for a long time collecting himself. Suddenly he heard a crackling sound and the smell of smoke reached his nostrils. The raiders were burning the house! The feeling of utter despair filled his gut again. All Granville and Eppie’s belongings, the Hawken, the saddle, any supplies and utensils would be gone. After a time, he heard the sound of men mounting up. He looked again to observe which way they were going. The bearded leader on the gray horse was sending them out in different directions. They were not leaving. They were searching for him. Fear welled up in his throat. He fought the urge to jump up and run. The old man’s words came to him. “When you get in a tight spot, don’t panic, keep your wits about you. Act only as fast, or take as much risk as you have to.” Purcell would crawl back down the fence and save his strength for a last chance sprint to the horse. He crawled fifty yards, and looked through a hole between stones in the fence. Two riders were making their way toward him. One stopped at the stone spring house. One rider poked the door open with the barrel of his carbine. The other rider kept on coming up the fence. That rider stopped a few feet down the fence to wait. Purcell slipped the knife from the sheath, gathered his right leg under him, and flattened against the fence. His mind raced. No, that would not work. He put his knife back. His only chance was to wait them out. They came nearer and stopped on the other side. The one with the gravely voice eased his horse over against the fence. He was directly across the fence from Purcell. Purcell could see a patch of horse hair through the hole between the stones. If the rider looked over the fence he would see him. Purcell waited until they were well away from him. Then he worked on down the rock fence. At the end, he snaked over the wall and crawled into the underbrush, retracing his earlier route. When Purcell reached the overhang he went to the pig pen. He opened the panel gate. The hogs would survive if the raiders didn’t find them. He let the cow loose. Grass was coming on and the cow was heavy with calf. The milk flow was about ready to dry up, anyhow. Looking at the small sack of seed potatoes, he realized that he had some scant provisions after all. He tied the open end of the gunny sack securely with twine, then he distributed the potatoes evenly in both ends of the sack. Picking it up in the middle he placed the sack over the horse’s shoulders. He pulled his jacket on to cover his easily-seen red shirt. He picked up the harness bridle and despaired again at his lack of equipment. With the knife he cut the blinders off the bridle. Before this was over Ben would need to see on all sides. He cautiously worked his way up the ridge. He turned the horse toward the top, knowing that he would probably be seen when he went over. There were four or five hours of daylight left. Once into the Blue Ridge he could lose them. When night came he would slip back, swim the river if needed, cross the Pike below Harrisonburg, and go into the Alleghenies. In his mind it was as simple as that. He would get supplies and equipment along the way, somehow. There was a shout, followed by more shouts from below. They had found him. Purcell started over the crest, then he turned the horse around to face the riders below. He cupped his hands around his mouth to make his voice carry. “Come on, you women-shooting sons-of-Satan! I’ll give you a run for your money!” His challenge was met with curses and a volley of gunfire. Over the crest he let the big horse pick his way down the timbered hill. Reaching the open valley floor at the bottom of the slope, he gave Colonel Ben his head and hung on. They entered the timber on the other side long before the raiders came over the ridge. The horse wasn’t even breathing hard. The ground was higher. The timber thicker. The sun was getting low. Purcell was sure he had lost them. He found a grass-covered opening ringed by brush. He slipped off the horse’s back and opened the potato sack. The horse eagerly began to graze. Squatting, Purcell held the picket rope and munched on a potato. It was crisp and tasted good. He would find something else tomorrow. He knew he would soon tire of raw potato. The buckskin jacket felt good against the evening’s damp chill. Eppie had made it for him two years ago. He and Gran had scraped and tanned the deer hide themselves. She had made it much too large. Her explanation was that it would last a long time, and he would grow into it. Although it was still a little too large, he realized he was beginning to fill it out. The jacket, the red flannel shirt he wore, and the jackknife in his pocket was all he had to remember Eppie by. In the hours since the killings he had reconciled to the fact that Granville and Eppie were gone. He was alone again. Granville and Eppie had treated Purcell well. He knew he had became the child they never had. Granville Coldiron was a great-uncle, the older brother of Purcell’s mother’s father. Purcell’s mother died shortly after his birth in New York. His father was a sea captain, and left the baby with his maiden sister. When Purcell was ten years old, she succumbed to the ague. His father placed him in a private boarding school to prepare him for application to a military school. Young Stephen Purcell was a bright student, full of energy that sometimes brought him trouble. Tall with dark hair, Stephen looked older than he was. The headmaster decided he needed something in addition to his studies to keep him busy. He was hired out to a telegraph office as an office boy. In a few weeks time, Purcell had learned to use the telegraph. He worked as a part time operator. He became familiar with the sending and receiving equipment. He studied the maintenance of the batteries and wires. Purcell was all eyes and ears when the line construction and maintenance crews were in the office. He occasionally went to the construction site with them. It was shortly after Purcell’s fifteenth birthday when the headmaster called him to the office and gravely informed him of his father’s death. His father’s ship was believed to have gone down in a storm off the coast of South America near Cape Horn. Knowing that the money for schooling would soon run out, the headmaster quizzed the boy about relatives. He found that Stephen Purcell had few known relatives, the closest being an older brother to Purcell’s mother. The uncle was, or had been, a politician that had resigned his office and went west with the forty-niners seeking his fortune in California. He had not been heard from for many years. The other relative was an older brother to Stephen’s mother’s deceased father. That uncle was living in the Shenandoah Valley near Cross Keys, and Port Republic. The headmaster wrote to Granville and Eppie Coldiron, inquiring what he should do with the orphaned boy. The response came back with a bank draft, along with instructions on how to send the boy by railroad. Granville and Eppie met him at the railroad station at Mt. Jackson. They traveled to the farm in a carriage behind a team of horses. Staying overnight in New Market, they arrived at Granville and Eppie’s home late the next day. When Stephen Purcell awoke the next morning, he realized he was in a strange and entirely different world than he had known before. The farm was located among rolling hills, close to the mountainous area on the East side of the Shenandoah Valley. It consisted of rail-fenced fields, pasture, and timber. A large barn housed the horses and mules. Breeding pens and sheds were located on another run, a little farther from the main buildings. Other stables with smaller sheds and buildings for cattle and swine were located in an opposite direction. The Coldirons were traditionally a family of blacksmiths, so there was a blacksmith shop and a carpenter’s shop. A rock-walled flower garden, and a large vegetable garden completed the farmstead. The first floor walls of the house were made of logs. There was an opening in the center with a flagstone floor, commonly called a dogtrot. The second floor, constructed of board and batten, contained the sleeping rooms. Three log-and-board cabins located to the side of the yard made living quarters for the stock handlers and field hands. It looked nothing like the New York City streets Purcell was familiar with. He knew he would hate the farm, and had decided to leave as soon as he could. It didn’t happen that way. He had liked the valley, the mountains, the farm, and the work that came with it all. He helped train and care for the horses and mules. The colt they called Colonel Ben became his constant companion. Colonel Ben snorted, interrupting Purcell’s thoughts. Darkness had closed in around him. The Reb raiders would be around their cooking fires now. It was time to move. To follow Purcell on the rest of his journey, order your copy of The Shenandoah Sharpshooter today.